Ecosystem all over the world are declining, but scientists and communities are applying numerous restoration techniques to be able to return ecosystems to what the once were. Does restoration work? Can it be a solution to reverse human impact on ecosystems? Read below on how seagrass restoration in Virginia is showing promising results! Article: Reynolds, L. K., Waycott, M., McGlathery, K. J., & Orth, R. J. (2016). Ecosystem services returned through seagrass restoration. Restoration Ecology, 24(5), 583-588. With increasing anthropogenic (human) disturbances, many of our ecosystems worldwide are experiencing severe degradation. This is alarming. These ecosystems are not only home to many animals, but they provide us with numerous ecosystem services (derived benefits and goods), such as food and medicine that allow us to have more comfortable lifestyles. As a response, many ecologists have applied ecological restoration where ecosystems are in need of accelerating their recovery after damages occur. This sounds like a perfect solution that could potentially allow humans to step in and reverse the damage they have caused on the planet. It is not that easy. Ecosystems can take a long time to recover, making it difficult to judge restoration progress. So then, how do we know that restoration is working and that services are being generated? Many restoration projects measure success by comparing the restored system to an existing natural and pristine system. In this study, the researchers re-introduced eelgrass to the system, a type aquatic vegetation that provides several provisioning and supporting ecosystem benefits. The researchers measured the amount of Nitrogen (N) removed and amount of Carbon (C) stored once this eelgrass re-introduction took place. Why N and C you may ask? Excess Nitrogen allows algae abundance to increase which means that the more removed, the better. Excess Carbon on the other hand is found in the form of carbon dioxide which contributes to global warming, the more of it that is stored, the less of it we have roaming free in the atmosphere. Why do we use eelgrass in restoration? In the 1930s, Virginia coastal bays lost most of its seagrass meadows and related fauna to diseases and storms. By 1997, patches of eelgrass recovered naturally and inspired a large-scale restoration project where the dominant seagrass, the eelgrass Zostera marina (Fig 1), was seeded into 125 ha of lagoon bottoms in 1999. Continued seeding until 2010 expanded eelgrass coverage to 1,714 ha of the lagoon bottom (Fig 2). Find out more about the project! Since the restoration period, the reintroduction of eelgrass has caused the ecosystem to experience increased water clarity, seagrass productivity, and benthic (ocean bottom) algal biomass. All of these may be positive signs of recovery, but to be certain the researchers focused on two essential ecosystem services; nitrogen removal by denitrification (Nitrogen decomposition) and carbon sequestration (storage) in sediments. Researchers analyzed aerial photographs taken between 2000-2010 to quantify seagrass growth over time and model seagrass meadow expansion in restored and natural areas. They used three different types of mathematical models (linear, exponential, and logistic) to predict seagrass expansion in the next 100 years, while comparing both restored and natural areas. By using seagrass coverage expansion and previous eelgrass N and C ratio usage data, they were able to determine how much N was being removed and how much C was being stored. Does eelgrass restoration really work? The researchers found that the eelgrass restoration in Virginia coastal bays is currently removing 170 tons of Nitrogen and storing 630 tons of Carbon in the sediment per year. They also estimated that in just 10 years the bays gained more seagrass coverage by restoration than they would have in a hundred years (Fig 3)! Seeding eelgrass was a successful restoration practice that enhanced seagrass meadow recovery and returned two vital ecosystem services. Fig 3. Modeled and predicted Seagrass coverage, Nitrogen removal, and Carbon sequestration over time. Resource: Reynolds et al., 2017. Nitrogen removal and carbon sequestration are two ecosystem services that can help regulate processes that influence the advancement of climate change. Restoring these services maintains macroalgae balance in the oceans preventing harmful algal blooms or macroalgae overgrowth that otherwise may affect or kill other organisms. It also decreases carbon in the atmosphere by storing it and preventing further contribution to global warming. Eelgrass can generate both of these services, which support healthy ecosystems and have immense ecological and societal value. To date, a net gain of 4,100 tons of N has been removed and 15,000 tons (more than the Eiffel Tour weighs!) of carbon has been sequestered as a result of eelgrass establishment. These numbers can translate to over 8 million USD in economic value. 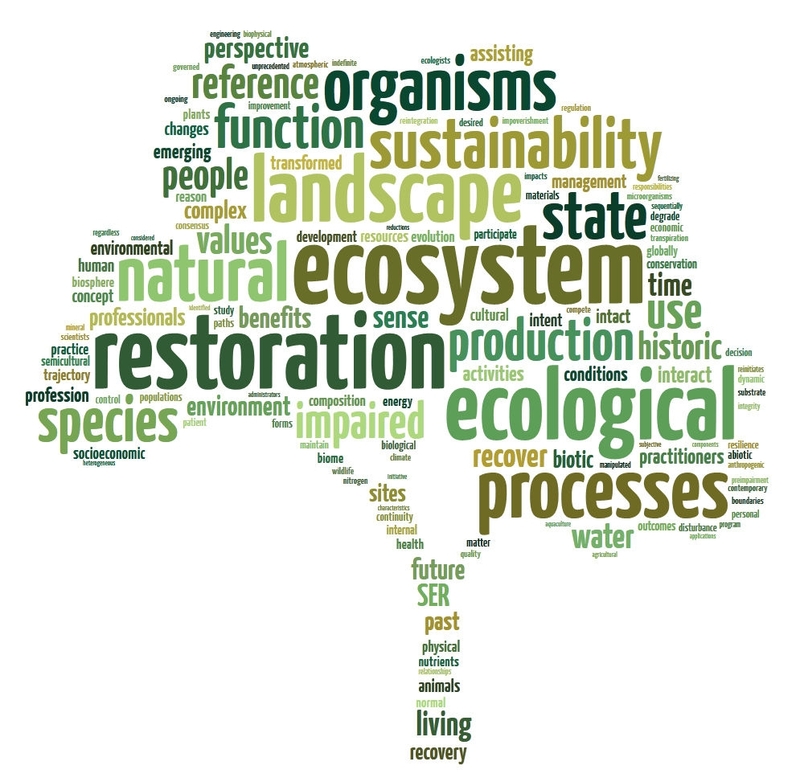 While restoration practices are being applied in many ecosystems, it is important to urge practitioners to value the importance of ecosystem monitoring after the restoration has taken place to efficiently evaluate restoration strategies. This study demonstrates the return of ecosystem function and thus shows restoration success in achieving project goals. As humans, we have caused a great impact on our planet but we also have the ability to mediate that impact and fight for a more environmentally-friendly way of life. I recently completed a MSc. in Biological Environmental Sciences at the University of Rhode Island where I studied the effects of coral restoration on Caribbean reef communities. I am interested in helping out our planet through ecological restoration in degraded ecosystems. When I am not out doing research, I am a marine biologist guide in Puerto Rico doing guided and educational tours of our natural resources. I am a traveling junkie with the goal of visiting every country in the world.